Qualifications Required: Working With Children Background Check.Full in-house training provided. Our support will cover every aspect of operating a small business. Training and Support: Our ongoing support covers every aspect of operating a successful Little Kickers business. All start-up equipment provided. Marketing Support: All branding templates providedCentral Marketing Fund for group marketing and PR. Little Kickers is Australia’s most loved preschool sports program. Our award-winning franchise is listed on the prestigious Entrepreneur Top 500 Franchise list at #199. We know that our brand is rewarding and incredibly popular….. over 60,000 children attending each week is a good indicator of this.. 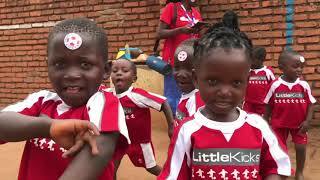 But, as someone who is looking to potentially join our team, you will be pleased to learn that the ‘fun and games’ are only a part of the success of the Little Kickers brand. It’s one thing to have a fun and engaging preschool program, it’s another thing to be able to franchise it successfully across multiple international markets, all of which have their own unique challenges and opportunities. Since launching in 2002, our brand and business has grown and evolved to the point where today we offer what we believe is the most comprehensive support currently available to those 300 franchisees in 30 countries who have opted to join our team. Franchisees have a range of support systems which include: huge depth of program, forums, videos, marketing and branding materials, various online training materials, sophisticated booking system, website, merchandise and Operation Manual. In the true spirit of franchising, we work together to gain a competitive edge for each other and utilise the depth of knowledge and experience across the globe to benefit each other. We offer a range of products split across 4 age groups, plus various other programs including Parties, School Holiday Programs and Infant Sports Programs for use within schools. Our program operates year round, closing only over the Christmas/New Year period, so franchisees do not need to worry about gaining new enrolments prior to a new term or face a drop in income. The children do not stop running ……and nor do we! Mackay is not just about the sugar cane! Get community focussed with this rewarding business opportunity! A fantastic chance to build a thriving and rewarding business as part of a truly global brand awaits. Engage the Hobart community and enjoy delivering The Little Kickers Experience! Families across the Port Macquarie region are crying out for Little Kickers to launch in their community! Are you the right fit to take on this truly unique business opportunity? One of the few remaining opportunities in the greater Brisbane area, this is a fantastic chance to grow your own Little Kickers business in the Glasshouse region and beyond.